Pistachios are nuts that are native to the Middle East and are a common and versatile ingredient in that region's cooking. Not only do they make healthy snacks on their own but they're also great for use as savory coatings on chicken or fish. But their use is especially prevalent in desserts such as the classic Baklava or Pistachio Cake. A galette is a free-form, rustic looking pie, much easier to make than typical pie crusts. 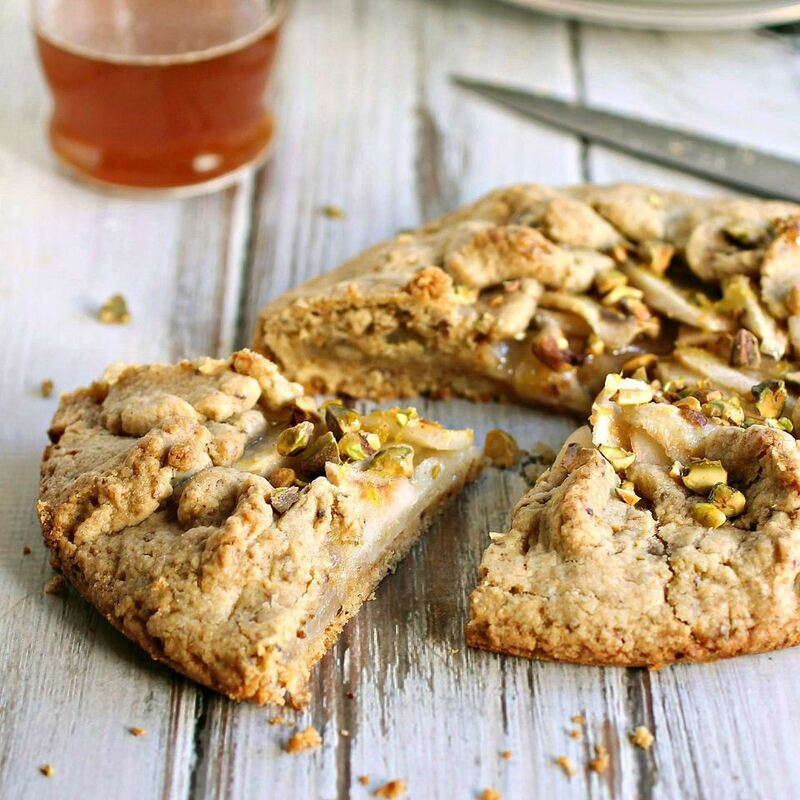 This easy pastry incorporates pistachios into the dough for a wonderfully nutty flavor and also uses them sprinkled on the finished baked dessert for a bit of extra crunch. The base is great with almost any fruit filling but this simple, pear filling makes a great seasonal treat. Honey, another common Middle Eastern ingredient, is a great match for the pears along with a touch of fragrant cinnamon. This recipe is a delicious, easy to make treat for an afternoon sweet fix or after dinner dessert. Enjoy! Add the 1/4 cup of pistachios to a food processor and pulse 2 or 3 times just to slightly break them up. No need to turn them into a powder. Add the cup of flour, 2 tablespoons of sugar, 1/2 teaspoon of salt and the stick of chilled butter. Pulse a few times just until the mixture resembles course crumbs. Then, with the machine running, slowly add the ice water and continue running until a dough ball forms. On a floured surface, roll out the dough to about a 10" circle. Layer the pear slices evenly on the dough, sprinkle with the 2 tablespoons of sugar and the lemon zest. Fold the edges of the dough up about a quarter to half of the way in. Place the galette on a baking sheet lined with parchment paper and bake for 45 minutes. To make the glaze, add the honey, sugar, water, cinnamon and salt to a small pot and heat until the sugar dissolves. Sprinkle the chopped pistachios over the finished galette and drizzle on the honey glaze as desired.